James Kaufman, a lawyer and former judge, has been engaged in business and practiced law for more than forty years. He has represented banks, doctors, hospitals, and automotive and marine entities, as well as other corporate clients, both nationally and internationally. His judicial background includes more than three decades as a litigator and fourteen years as Arcadia, New York, town justice. He has served in government as an administrative and legislative aide and as legal counsel to the late U.S. Congressman Theodore R. Kupferman of New York’s 17th Congressional District. 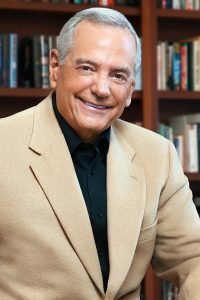 He has also developed and run several companies and currently serves as founder, chairman, and chief executive officer of The Kaufman Group, Ltd., an international consulting group providing strategic advice and help to grow businesses. Following his legal and judicial careers, Mr. Kaufman became an author.The Collectibles, Kaufman’s first foray into fiction, an Amazon bestseller and the winner of more than thirteen awards, sold more than 100,000 copies and became Book 1 in the Collectibles Trilogy. It is not about control or money but extensions of the heart. In The Concealers, Book 2 of the Collectibles Trilogy, Kaufman’s message is clear: we need to reclaim the trust that once existed between each other and has since begun to erode. Mr. Kaufman is uniquely qualified to write about trust. His broad experience and distinctly compassionate character is evident throughout a lifetime of living and working in the legal, government, and corporate worlds from which he has synthesized a powerful message. In The Conciliators, Book 3 and the conclusion of The Collectibles Trilogy, Preston Wilson’s life is once again imploding—this time as headline news, bylined by Katherine Kelly. Under fire, thanks to the financial shenanigans of a long-time friend, the CEO finds himself in trouble with the FBI, the Russian Mafia and his creditors. If he doesn’t come up with a plan—and quickly he could lose everything and find himself, his wife, and his shareholders in prison. Inspired by Joe Hart’s life lessons, Preston sets a new course fighting for what matter most: his family, his friends and the collectibles. The Collectibles Trilogy could not be more relevant today. It offers a message that he believes is can restore the values that made our country great and which, in his view, can once again change our world and our lives for the better. Mr. Kaufman has also written several non-fiction books, including Noise, A Problem to be Heard: Control of Noise through Laws and Regulations; What to do Before the Money Runs Out —A Road Map for America’s Automobile Dealers; Trial Structure and Conduct; and North Carolina Trial and Appeal. Mr. Kaufman is a member of the esteemed Players, Gramercy Park, and a member of the preeminent Union League Club, both in New York City, as well as a member of the Cape Fear Club in Wilmington, NC. He is a former Board Member and Chairman of Imaging The World (ITW), a not-for-profit healthcare company delivering ultrasound services to Uganda and other underserved populations, and in the process saving many lives. Kaufman lives in Landfall, Wilmington, NC, with his wife.